Kubernetes is one the most widely used container orchestration technology out there. Kubernetes is hugely popular because it offers the ability to resolve problems and offers an out of the box way of thinking about deploying, managing, and scheduling the applications. On the other hand, OpenStack is a software application that allows a business to run their own Infrastructure-as-a-Service (IaaS) and it is considered as future of cloud computing. In 2016, the OpenStack community aimed to reshape OpenStack in Google’s image, containerizing OpenStack services and managing them in Kubernetes. There is always a perceived competition between OpenStack and containers such as Kubernetes but in reality, these two giants in open source technology can be a great combination as both the technologies are complementary to each other. 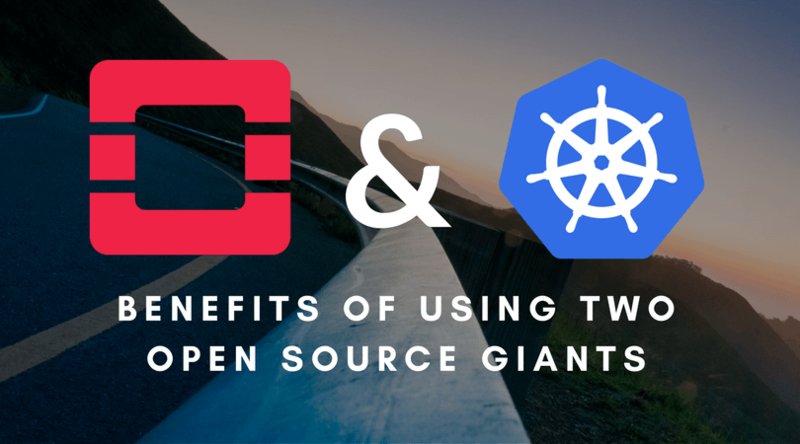 They both solve problems that are similar in nature but on different layers of the stack, so combining both Kubernetes and OpenStack’ can give users more scalability and automation than ever before. How can Kubernetes and OpenStack work together? Containers are a packaging format with good tools that meet the needs of application developers. Kubernetes is a best-practice application deployment system ensuring the needs of app operators. OpenStack is an infrastructure framework enabling all sorts of infrastructure solutions, ensuring the needs of infrastructure providers. Containers can be aligned with OpenStack, providing infrastructure, allowing them to share networking and storage with other types of computer resources in rich environments. Kubernetes clusters can be deployed in two ways; either manually or through a provisioning API on OpenStack resources. This gives their pods all the benefits of shared infrastructure. Moreover, OpenStack operators can leverage container and Kubernetes technologies to facilitate their deployment and management of OpenStack itself. The OpenStack services are containerized by using Docker’s container format. Additionally, these services can be standardized on Kubernetes as the container orchestration fabric. This can enable OpenStack users to manage OpenStack in the same way that Google manages their services. Kubernetes has the ability to let the enterprise’s data move between different clouds, provided that they’re both running Kubernetes. That means, with the OpenStack services containerized by using Docker’s container format. This will make it possible to move data between OpenStack and other clouds. With the collaboration of Kubernetes and OpenStack, it is expected that wide array of benefits can be reaped. As Kubernetes’s features, flexibility and scalability make Stackanetes an efficient solution for managing the OpenStack. Whereas, incorporating Kubernetes into OpenStack will let Kubernetes user access a much robust framework for deploying and managing applications. Given below are the eight major benefits of running Kubernetes alongside OpenStack. Google run their internal system in a way that has been perfected over the years. This is reflected in Kubernetes as well as it allows a large scale distributed system to run smoothly. OpenStack, while having ample of benefits to give, lacks in stability to run smoothly. With OpenStack to run in ‘Google’s way’ and modernizing its architecture, it is expected that OpenStack will be more stable and easier to manage. With the growing keen interest shown by users to use OpenStack with the Kubernetes, it is expected that the solution has the potential to be immensely popular as it offers on-demand, access-anytime services. It also offers the capability of increased application portability, to reduced development time, allowing the apps to be more componentized and highly distributed. With the world moving towards cloud-native infrastructure and application patterns, it’s about time that OpenStack to be open towards this direction. Kubernetes and cloud-native patterns will improve OpenStack lifecycle management by enabling rolling updates, versioning, and carrying deployments of new innovative components and features. Kubernetes offers self-healing infrastructure. Thus, when Kubernetes is adopted as key components of their stack, it makes OpenStack easier to manage and more resilient to the failure of core services and individual compute nodes. The most common concern cited in hesitation to adopt container technology is the security. OpenStack offers a higher level of security when it is run alongside Kubernetes as businesses can use a bay in OpenStack Magnum to arrange a group of virtual machines or bare metal instances so that they are used by a single authorized user. OpenStack also supports the verification of trusted container content through integration with tools for image signing, scanning, and certification. As both Kubernetes and OpenStack are widely used by giants in technology world such as Google, Amazon or eBay, this makes both the technologies to innovate at a faster pace to resolve all sorts of unique challenges. Thus evolving both the technologies to integrate with one and another to enable an enterprise-grade infrastructure and application platform. For OpenStack to work along with Kubernetes, OpenStack has to embrace the container standards; this makes open standards for container technology more universal. Inevitably making it easier for organizations to set up and deploy container technology on OpenStack infrastructure. Just as Kubernetes and containerization bring benefit to rapid application development and delivery, bringing OpenStack and Kubernetes together can increase the resilience and scale of the OpenStack control plane and enable faster delivery of infrastructure innovation. In conclusion, Kubernetes and OpenStack are different yet complementary technologies that can be combined to achieve great good. As a cloud provider, VEXXHOST offers reliable OpenStack as a managed services and expertise in delivering Kubernetes on OpenStack that can smoothly solve our customers’ challenges in the most effective and efficient ways. Try our solutions for free by requesting a free trial below.